Each morning, Kay Smith scuba dives off the coast of Thailand. It is an idyllic way to begin the day, surrounded by reefs, azure water and shoals of rainbow-coloured fish. But Kay doesn’t live on some island paradise. Rather, this is the latest innovation to treat her chronic pain: virtual reality (VR). VR therapy involves computers mimicking a real-life environment, that is relayed through projectors — either tiny ones viewed through a headset, or huge projections on to the walls of a room. It’s been used since 2000 in specialist clinics to reduce pain in patients with burns, and is now becoming more widely available. The idea is that by being so immersed in what they see, patients are distracted from their pain. What’s more, by removing the emotional associations with pain, there’s an ongoing effect, as the brain becomes ‘trained’ not to respond to pain signals. The treatment is being expanded to include helping patients recover from stroke and helping those with breathing problems do their breathing exercises. Kay, 54, has lupus, which causes the immune system to attack the body’s own tissues, leading to chronic pain in her stomach and back. She also has mast cell activation syndrome, which triggers severe allergic reactions — including to the medication for her lupus and painkillers. Yet thanks to VR, Kay manages her pain without drugs. ‘As a former nurse, I wouldn’t have believed VR could have such an effect,’ says the mother of two. ‘I have suffered so much since I was diagnosed two years ago. Kay came across VR through GP Dr Keith Grimes in Eastbourne, Sussex. His interest was sparked when he used VR while playing computer games. Two years ago he decided to try it with patients — buying a High Street headset. ‘In May 2016, I tried it on a lady who had a wound that needed daily care,’ says Dr Grimes. ‘She was breastfeeding and couldn’t take pain medication. As she was a performance artist, she used Cirque du Soleil and other dance and it completely transformed her experience. So I decided to see if I could help more patients, tailoring content to their interests. Dr Grimes set up VR Doctors, an online forum for those interested in ‘virtual, augmented and mixed reality in healthcare’. It now has more than 600 members: among them Dr Muhammad Farhan Amin, a GP from Barrow-in-Furness in Cumbria, who has built a VR app for patients with lung disease that helps them do breathing exercises at home. 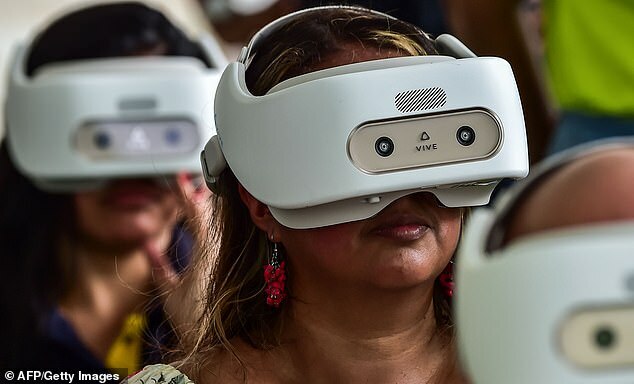 Also connected is the Royal Brompton Hospital in London, where a study is planned in which patients due for major surgery will watch a VR film about the intensive care unit, in the hope of reducing post-operative delirium. The theory behind VR is the spotlight theory of attention. ‘Your brain can only dedicate a certain amount of attention to one thing at any given moment and pain is just one compelling source of information,’ says Dr Grimes. ‘The aim of VR is to take the focus from pain onto something else.’ Studies are looking at other areas of medicine VR could help. This includes researchers at the Countess of Chester Hospital and University of Chester who are exploring using VR to help stroke patients re-learn daily activities such as pouring water from a jug into a glass. Professor Nigel John from the University of Chester believes VR could take away the tedium of rehabilitation. So instead of patients using real water — which could get messy and tiring — it becomes a virtual game, with timings, assessment and increasing difficulty. But Dr Ilan Lieberman, a pain specialist at Wythenshawe Hospital, Manchester, says that there are potential drawbacks with VR, as ‘the image has to be absolutely clear, otherwise in some cases it could make matters worse’. ‘For example, if the brain already has a distorted issue — perhaps relating to balance,’ he says.